A new deal every day from Audible. Today’s deal ends 04/16/2018 @ 11:59PM PT. 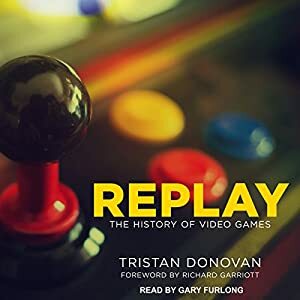 A riveting account of the birth and remarkable evolution of the most important development in entertainment since television, Replay is the ultimate history of video games. From its origins in the research labs of the 1940s to the groundbreaking success of the Wii, Replay sheds new light on gaming’s past. Along the way it takes in the spectacular rise and fall of Atari, the crazed cottage industry spawned by the computers of Sir Clive Sinclair, Japan’s rapid ascent to the top of the gaming tree, and the seismic impact of Doom. Replay tells the sensational story of how the creative vision of game designers across the globe gave rise to one of the world’s most popular and dynamic art forms. Based on extensive research and more than 140 interviews, Replay includes insights from video game legends such as Atari founder Nolan Bushnell, Will Wright – the creator of The Sims , Doom designer John Romero, and Hironobu Sakaguchi of Final Fantasy fame. Replay also includes a foreword by Richard Garriott (AKA Lord British).